Sir Pierce has a busy job. Kindergartner by day, Knight by night. Sometimes, it seems that the moment he gets home from school, there is a damsel in distress. 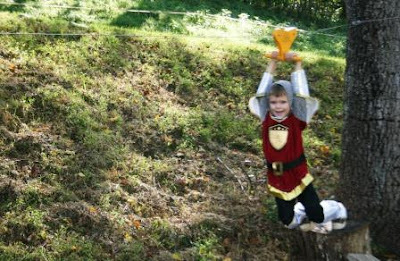 Every good rescuer needs a few medieval knight costumes in the closet, and Sir Pierce is no exception. With no time to waste, Pierce is storming the castle! Neither dragon nor moat nor flaming cannons can stop him! This is supposed to be Pierce's mean face. Please don't tell him his mean face is kind of cute and dashing. It might hurt his feelings. We were sent this most excellent Armor for Knights costume to review for Wholesale Halloween Costumes. It came in a splendid garment bag, for easy storage throughout the year. As Pierce put this on, he kept saying, "WOW, This is so cool!" Pierce declared the costume very comfortable. You can see by the pictures that it is easy for even the most active of little boys to wear around - it will not slow your child down! That makes it a great costume for parties or school. Also, it's the type of costume you could put layers on underneath for trick or treating, if it's extremely cold outside. We ordered a size small, and it fits quite well. Pierce is so excited to wear this for Halloween 2012! Readers, do you have costumes planned already for Halloween? 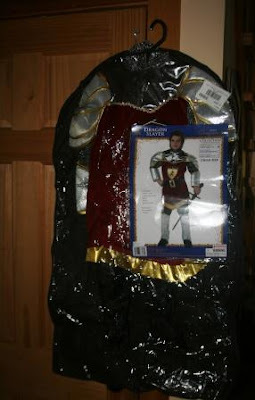 Disclaimer: We were sent this medieval knight costume by Wholesale Halloween Costumes for review purposes. The opinions stated above are my own. The costume does not come with a sword - it may be purchased seperately. These are the cutest photos! No wait; I meant: Sir Pierce the Fierce, rescuer of maidens and tamer of dragons, I salute you! What a neat sword, I wish that I would have had an outfit like that 50 years ago. I bet be can find a lot of dragons to slay around your yard. He makes a very handsome Knight and I know he will save the day! How mean he looks! :) I remember the medieval era at our house. Those are such cute pictures! They don't celebrate Halloween here, so I haven't had to experience the "costume" search yet. I love costumes for kids. 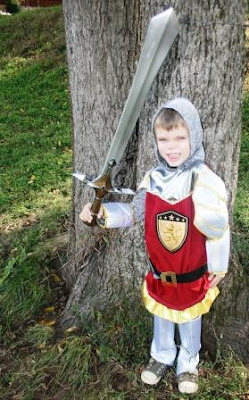 The Knight costume is one any boy would love to have. Pierce will be slaying dragons for many days to come. I hope you all have a great day. In Pierces own words... "WOW, This is so cool!" What kid wouldn't want a costume like that?? That costume is so cute, and Sir Pierce makes quite a dashing Knight. What fun! With that "mean" face and that fabulous sword, he can slay many a dragon, I'm sure! 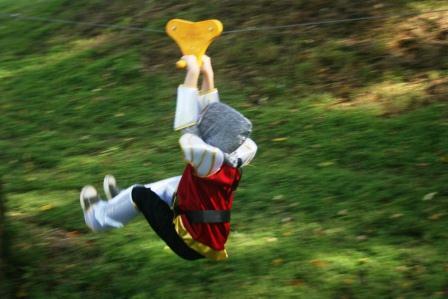 He looks adoreable in that costume and I love your zipline. Very cool. Ben would love this costume.. But what he would really like is the zip line.. My son, Rich has one at his house and Ben got to experience it and got the thrill of his life.. It starts 15 feet up in the tree house and then goes all across the back yard.. It's a thrilling ride. Pierce looks royal in his costume. Such fun~! your such a great mom..
Sir Pierce IS so cute, and some day he will grow into that mighty sword of his too! It looks like a nice quality costume that Pierce can wear not only for Halloween but many other adventures as well! Amy and I want to be pirates for Halloween-even if all we do is answer the door and say arrrrrrg! How incredibly cute! I have to agree with you, the "mean" face is cute. But I won't tell him that! What a cute costume! And it looks VERY mobile, which is important for kids. That is just too cute. But please don't tell him I said so. :) "Knight by night"--love that! That zip line looks like so much fun! I love the costume! I swear boys like to dress up just as much as little girls. That face could never look mean! Very cute costume. How cute is he!!! What a fun review. Oh, that looks like such fun! Just what every Southern belle needs...a knight in shining armor...and is Harriet ready for her feats of bravery? I agree that he doesn't have a whole lot of fierce in that face, but who cares? He's sooooo cute! As is the costume. WOW! That IS a cute costume! Are the boys fighting over it? He is the most handsome Knight ever! Pierce is such a cute little prince charming! I've got to figure out a costume for my kids yet. That IS a very cool costume! That zip line is awesome. Love it! Deaglan chose a knight costume too. However, when I pulled out old costumes he's leaning more into being what he was last year. I'd like to see the knight costume get some use. I guess I've got a month to convince him.